I’m afraid I’ve been knitting and spinning more than I have been posting lately, and I am developing quite a backlog of things to tell you about. 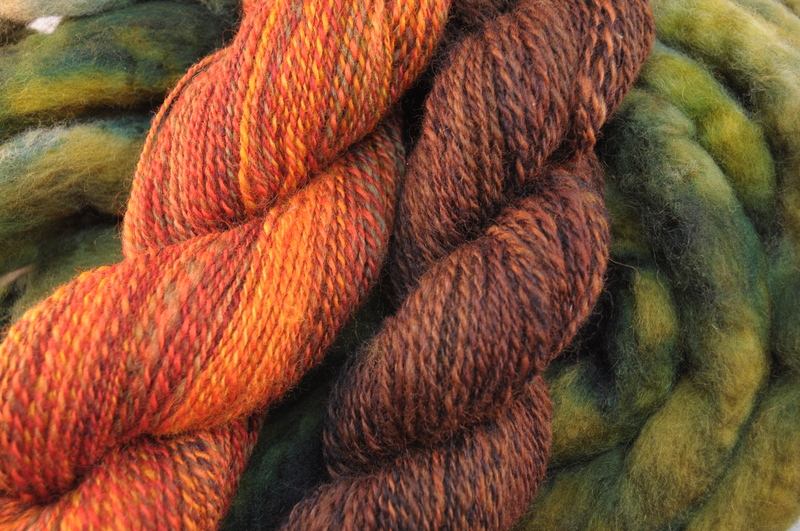 For tonight, I think we’re a bit overdue for an update on the Fall Colors sweater, yes? The Finn didn’t get at all sticky this time, and it has been absolutely beautiful to spin. It’s a nice fiber even when I get it wrong, but when I get it right, it’s amazing. 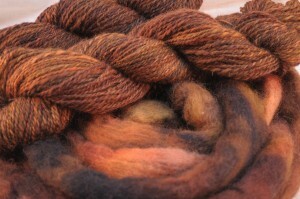 When I dyed this fiber, I knew that I wanted to match the original red-orange colorway. 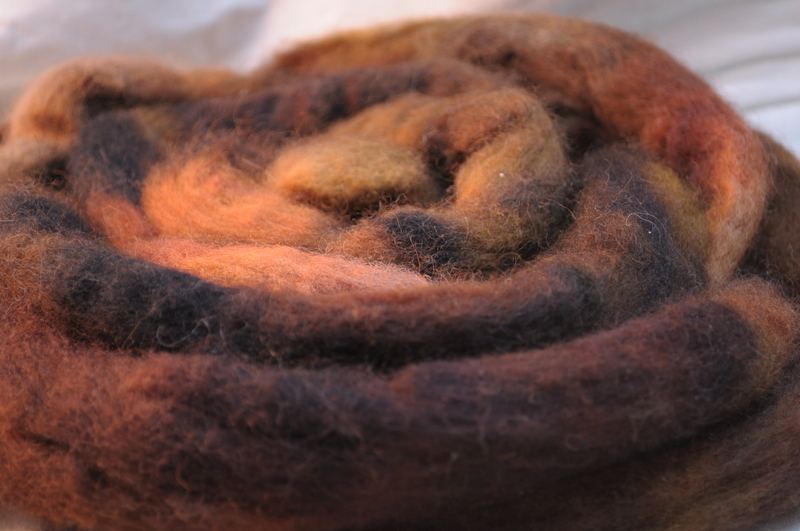 I used the same brown dyes that I had used to accent the red-orange fiber, and then added in a tiny bit of the orange and even a little bit of green. You can’t see it too well in the photo above, but it’s there. I was surprised to see how much that came across in the yarn. There are sections where one ply is a deep, olive green instead of brown, and a couple of spots where it lightens up almost to orange. I’m hoping that will help to tie the colorways even closer together in the final piece. I used the same strategy for the green, dyeing it with the orange as a base dye and adding teal to make the green I wanted. Then, I threw in some dabs of brown here and there, and a slightly lighter green to brighten things up. So far, I think they go really well together. I started spinning the green at the Spinning Guild meeting on Monday. I can’t wait to see how it comes out! You have been busy! Those colors look lovely together–I can’t wait to see how you use them. I’m a bit behind blogging myself, mostly because I can’t remember to take pictures when the sun’s actually shining! Me, either! That is going to be gorgeous. I really like those colors together – there is something about those fall oranges, in particular, that make me very happy. Love the brown! The two colors look great next to each-other. Fabulous. And so good to include the green. Fall is never one homogeneous palette, at least if you have more than one species of tree in your neighborhood. DesigKnit is powered by	WordPress 4.8.9 . Page generated in 0.290 seconds using 40 queries.